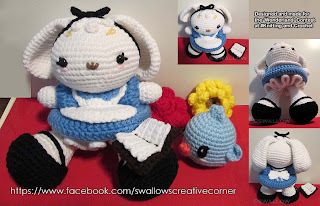 I designed and made this bunny specifically for the 'Wonderland' Contest at 'Knitting and Crochet' on Deviantart. The bunny is 8.5 inches (22 cm) in height and 5.5 inches (14.5 cm) in width. Her book is just placed on her lap because she's reading to the bird. ^__^ I modeled her outfit after Alice's from Disney's animation. She has a bunny tail, but her dress kinda covered it. XD This bunny took me about 1.5 days to make.